In the category of ‘is it really systems thinking?’ ‘well, I don’t know, but I’m putting it here anyway’ is commitment-based management. I include a bunch of good links below and would value comments and questions on my commentary here. This is one of only two management/leadership systems I have *ever* come across which (1) has been actually implemented across whole organisations, in full and (2) has led to significant performance improvements. The other is Jacques’ stratified systems theory and later versions of this in requisite organisation and MacDonald et al System Leadership Theory. Interestingly, both are significantly about clarification of limits and scope of discretion, and engaging discretionary activity. The latter seems to me potentially more ‘complete’ and blending structure, management, and leadership, and technical and social solutions, whereas commitment-based management seems more like an integrative mechanism that could increase performance in any context, but might not shift all those other elements. I suspect that a third is ‘command and control management’, as originally conceived and named – The Puritan Gift has some potential evidence of this, but I would welcome more. It can of course be argued – quite powerfully – that some forms of distributed management, as set out for example in Reinventing Organisations, and other documented examples of cooperative and related forms (Gore, that orange company in California). However, while these are great examples of organisational success and sometimes of transformation, I’m not convinced that there is any replicable system (such as Holacracy sets out to be) behind this. Nor am I convinced that the ‘teal’ philosophy or similar provides this kind of potential. Some will make claims for ‘lean’ and Deming-based management systems. Again, there’s a potential category argument here – are they operations and coordination interventions ‘only’? Do they actual comprise a management/leadership model? Some might also make claims for Beyond Budgeting, but I think they are weaker in terms of being an actual ‘methodology’. I am sure I am missing some approaches. Of course, all these are just attempted solutions to the problems of organisational coherence and coordination and managing both hierarchies and networks and their emergent properties, and all are context-dependent and specific. Perhaps I’m just more impressed that commitment-based management and Jacquesian approaches have succeeded in making traditional hierarchies highly functioning. Oh, and ‘agile’ (much like project management) seems to me to be a tactical solution to the same kind of coordination problems. By David Arella – CEO at 4 Spires, Inc. Scrutiny reveals that our common work norms do not support this principle. In fact, many common work practices actually get in the way. People make vague requests. Actual performers are unspecified. Delivery dates are proposed without confirmation – if they are mentioned at all. Agreements to deliver, when they are obtained, shift and derail without clear dialog. Expressions of satisfaction with the delivery, or of dissatisfaction, are absent. Closure is rarely achieved. 5. 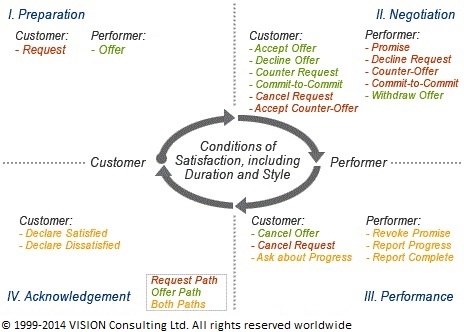 When the requester, always acknowledge and assess the delivery. Honesty and truth demand an assessment as to whether the delivery met the original expectations. Answering the question – were you satisfied? – completes the cycle and assures closure. This underutilized practice is the minimum quid pro quo to the effort of the performer and serves to represent the customer’s accountability to honor the agreement. Moreover, these are the “golden moments” when feedback can enhance both future performance and trust. End-of-year performance reviews have lost much of their value, and this practice heightens the value of more continuous performance feedback. PS I meant to add some unclarification and obfuscation. It is clear to me that traditional contracts of employment and job descriptions are ‘perfectly acceptable’ to most people, most of the time. And that role clarity proposed by Jacques (and the SLT team process etc), promise or commitment theory, and the multilateral negotiated contracts of that Californian orange growers company are ‘better’ in that they force clarity, negotiations, and build both trust and higher-quality, explicit responsibility conversations. And yet, and yet… I feel I have seen somewhere in non-violent communication something along the lines of ‘every commitment is an act of violence’ (I can’t find it by google so it is probably on twitter). There is definitely something in this, something self-negating in a fundamental way about making promises for your own future fulfilment. In all these systems, of course, active discourse and re-evaluation is a critical part of it. And I accept – traditional roles and management vs the approaches we are discussing here – that active negotiated commitment is deeply different from assumed, enforced commitment. But still. And the Italians even have a proverb – ‘every promise is a debt’ – which speaks to the same thing. I bet there’s an even better Hebrew proverb, there usually is. This speaks to the same challenge, and brings to mind the hugely powerful agile/extreme programming concept of ‘technical debt’ or backlog in organisations – the hang-over of work to make good on requirements not quite critical to immediate delivery, but necessary to prevent the slow creep of entropy from engulfing the whole organisation. This must link to Bateson’s distaste for ‘purpose’. I don’t mean something so crude as ‘we have committed to the plan, so we’ll deliver the plan – bugger the results’ (though Nietzsche has a brilliant line on this – ‘many are obstinate with regard to the once-chosen path, few with regard to the goal’). That’s part of what we are talking about here, but the tyranny of purpose and the exclusion of wholism that seems to imply might be important. NB This-all is different, I believe, from ‘promise theory’, though perhaps there is a link – this (though it can be organisationally applied) is about an information science concept which ostensibly provides an alternative to ‘command and control’ in that sphere. Promise Theory, in the context of information science, is a model of voluntary cooperation between individual, autonomous actors or agents who publish their intentions to one another in the form of promises. It is a form of labelled graph theory, describing discrete networks of agents joined by the unilateral promises they make. A promise is a declaration of intent whose purpose is to increase the recipient’s certainty about a claim of past, present or future behaviour. For a promise to increase certainty, the recipient needs to trust the promiser, but trust can also be built on the verification (or assessment) that previous promises have been kept, thus trust plays a symbiotic relationship with promises. Each agent assesses its belief in the promise’s outcome or intent. Thus Promise Theory is about the relativity of autonomous agents. One of the goals of Promise Theory is to offer a model that unifies the physical (or dynamical) description of an information system with its intended meaning, i.e. its semantics. This has been used to describe configuration management of resources in information systems, amongst other things.